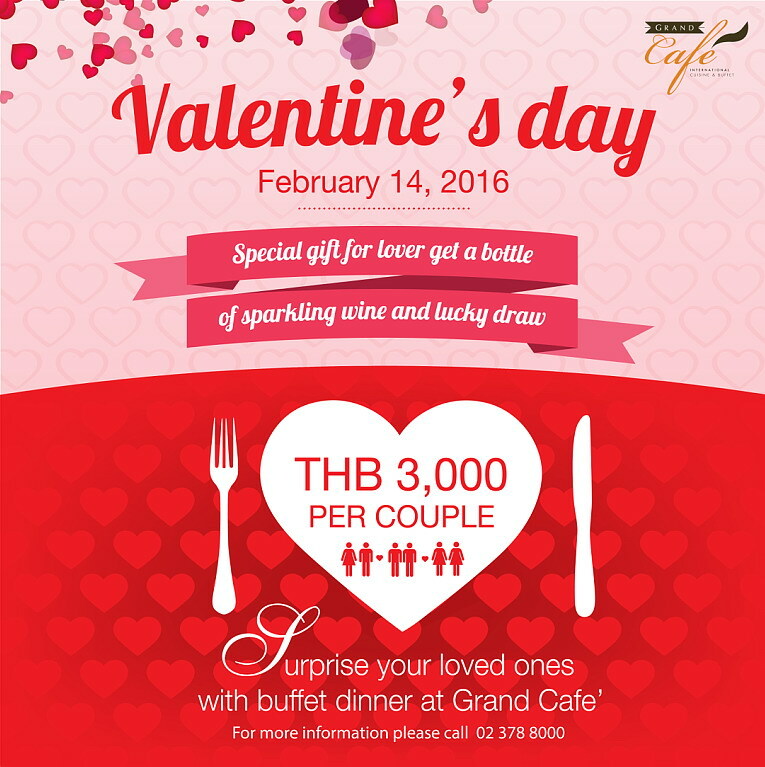 Celebrating on Valentine’s Day, share the party time with your lover at Grand Café, The Grand Fourwings Convention Hotel on February 14, 2016. Welcome dinner under candlelight featuring with special International Buffet with your love. Start with European Food like assorted pasta freshly cooked to taste like. Full flavored of Thai Food sour, sweet and spicy. Popular Chinese Dishes like Din Dum, Steamed Dumpling and Chinese soup served hot. Japanese Food with Sushi caravans. Unlimited Seafood on ice including shrimps, cuttlefish, Big Mussel and Fully of B.B.Q to you should not miss. Finish with seasonal fruits and assorted desserts at price THB 3,000++ per couple. Serve for dinner 18.30-22.30 hrs. Special!! Love Teddy Bear and Sparkling wine and The Big Prizes of Lucky Draws. วันที่ 8 กุมภาพันธ์ 2559 เวลา 16:15 น.